We attend the Divine Liturgy every Sunday and sometimes during the week as well. Admittedly, for us adults, there are times when it may seem like a long service, and so we can be assured that our children will sometimes feel that same challenge more acutely. Depending on the child, their age, and their ability to understand what’s going on, helping a child to learn to participate in the Liturgy can seem a daunting task. Getting beyond merely attending (being present) to truly ATTENDING (paying attention and participating) isn’t easy for any of us, especially for children. The Orthodox Church considers all of its members, including children, to be an important part of the Church's life. Therefore it follows that even the children are needed in the work of offering worship. So here are things that parents can help their children do during the Liturgy to participate more fully. The very tiniest among us can see the candles, the icons, the clergy, and the choir. You can whisper, “Where's Jesus? Can you see Jesus? Can you see Mary, His mother?” In this way, you are pointing their thoughts towards why we are in Church: to be in God's presence and to lift our hearts and minds towards Him. Young preschoolers can look for items in the church such as crosses, animals, the color of Jesus' robe, etc. Older preschoolers can count how many of those items they see, how many candles are burning in front of Jesus' icon today, etc. Young elementary students can look for the icon of St. John the Baptist…the Forerunner, identify the Gospel writer whose Reading we hear during the service, what's in the icon of the Theotokos, etc. The list of things to look for is limitless. It takes a little adult pre-planning to think of things for the children to look for. 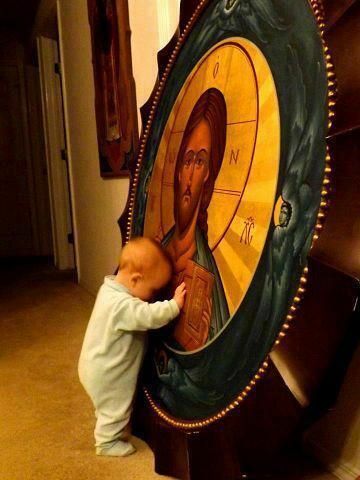 Even very tiny children can show their love for God and their veneration of the saints by kissing the icons, the Gospel book, the priest's hand, and even their fellow parishioners. (When you take your child to the chalice for communion, you can whisper afterward, “Let's kiss the icon of Jesus. We love you, Jesus! Thank you for giving us your Body and Blood so we can live more like you this week!” and then you venerate the icon. Eventually, your child will also want to kiss the icon.) Be sure to include the children around you in the Kiss of Peace, as well. Although there are many opportunities to be silent, there are places that children can (and should!) talk during the service! There are plenty of opportunities to talk, but it’s our role to help them learn when those opportunities are, and what they should say during those times in the Divine Liturgy. With a cue until they get the hang of it, very young children can begin with the “Amens” during the the time when we are sanctifying the gifts. Then, as they learn the following, they can also join in for (probably in this order): the Lord's Prayer, the Creed, the communion prayers, etc. Children can sing “Lord, have mercy!” from a fairly early age. They can learn other responses to the prayers and refrains to the antiphons as well. They can learn to sing the Hymn to Saint Basil, the Trisagion Hymn, the Cherubic Hymn, the list goes on and on throughout the service. A key to having the children sing along during the Liturgy is for them to hear other parishioners also singing along. Children who are surrounded by adults who sing along tend to join in as they are able. Children can hold service books, either a child's version (we have some of these in our bookstore) or the regular service book. Children can also hold and pass the offering plate. While in their parents’ arms, and then on their own once they know how to balance on their feet, children can learn to stand reverently during the Epistle, the Gospel, and the Great Entrance. As they get older, they can stand longer and longer until they are able to stand for the entire Liturgy. There are even opportunities for movement during the Divine Liturgy! Once again, it takes a little pre-teaching, but even young children are able to make the sign of the cross, bow their heads unto the Lord, kneel if/when applicable, reply to Father's bow with one of their own, etc. We can help the youngest ones to do so, taking their baby fist in our hand to make the sign of the cross over their body, etc. The older ones, with a little preparation ahead of time, can participate fully when the time comes in the service without us physically helping them as much, because they have practiced and they know what to do. Children love to participate. They long to feel a part of things. They want to contribute to the world around them. The ideas above are merely a few ways that we adults can help the children to do so during the Divine Liturgy.